Welcome to fall! I love visiting new sites to photograph, although those trips are sometimes less productive than trips to places I've been before. That's because I like to visualize my work in advance, which is very tricky with a place I've never laid eyes on before. With the fall colors setting in, I decided to throw the dice and explore someplace new. Earlier this year I purchased an annual pass to visit all of Virginia's State Parks. I've certainly earned my money's worth with the pass but there are several parks I hadn't visited. 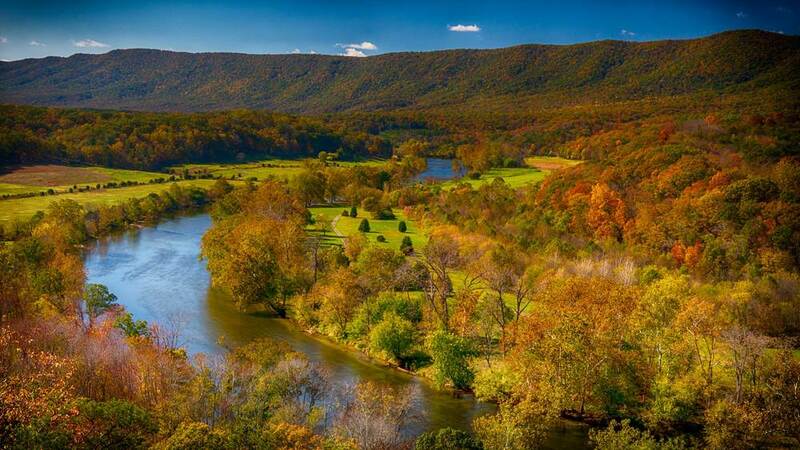 Amongst them was the Shenandoah River State Park. This park sits at the base of the Shenandoah National Park, about 1.5 hours from Washington, DC. It's a decent sized park, but certainly much smaller than the adjacent national park. One of the highlights for visitors is an overlook that offers a great view of the Shenandoah valley and the river passing through it. This view was accentuated by the bright fall colors on this clear Sunday afternoon. The fall colors are hanging around for another week, so be sure to go out and see them before they are gone. Should make for some more great photography!